Federico da Montefeltro: the most famous nose in Italy and the first rhinoplasty. 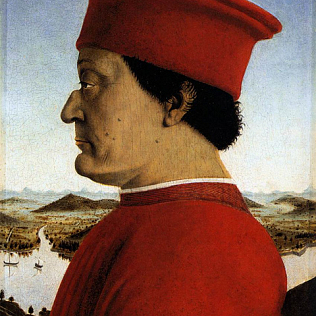 Federico da Montefeltro (1422-1482) – lord of Urbino – was a great Renaissance condottiero (warlord). He was also a great lord, patron of important artists: for example, we owe to him the construction of the Ducal Palace of Urbino. At the Uffizi Gallery, there is the very famous diptych representing The Duke and the Duchess of Urbino, by Piero della Francesca. In the two panels Piero painted Federico and his wife, Battista Sforza. Both of them are portrayed in profile, in a position that remember the one of the medals, where the figures are very solemn. Beyond the artistic importance of della Francesca’s work, this painting is world-renowned because it highlights Federico’s profile, and above his very singular nose: we can see that a part of it is missing! What happened to Montefeltro? Around 1450 he took part to a tourney: here he was injured with a lance and he lost his right eye. During the 15th century, a wound like that could have been deadly, but Federico pulled himself together very soon: according to the legend, he said: «Patience, I’ll see better with one eye than with a hundred!». So, he decided to cut the upper part of his nose away, in order to see better with his left eye. Probably this nose is one of the most famous in history, because of the empty space that we see in the profile painted by Piero. Maybe it is also the first nose job that we know about, and we can only imagine how much Federico suffered during the surgery. The accident and the surgery did not block his career: he became Duke of Urbino. Federico is a very representative man of the Italian Renaissance: because of his love for art and beauty, still today Urbino is considered “his” town.